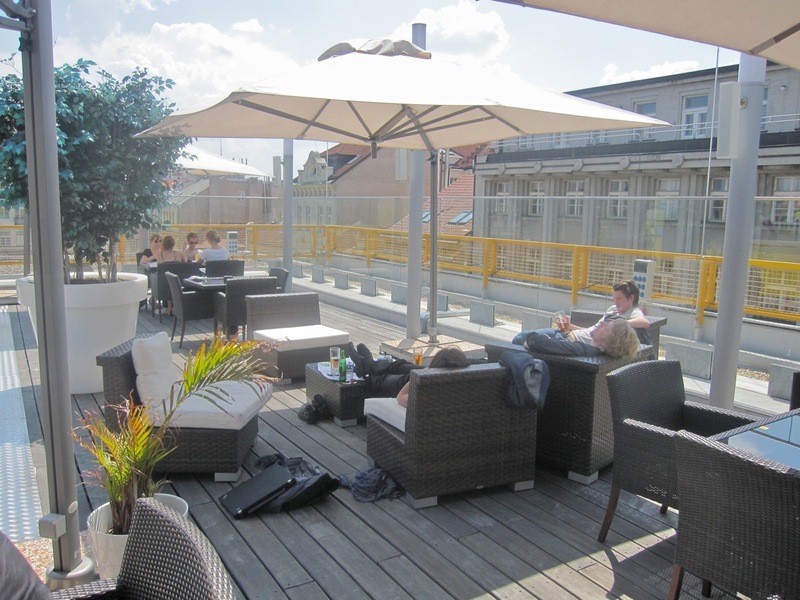 Right smack dab in the middle of town, there's a new chill out spot far from the madding crowds, eat tapas and grilled meats, and soak up some sun. It's on top of building that houses Tesco and the My Narodni department store (cue sound of a stylus skipping across record). Wait, what? Tesco tapas? 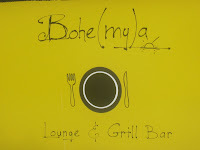 I doubted Bohe(my)a Lounge & Grill Bar would be worth checking out when I first heard about it. Then I read the menu on Facebook and I was enticed. The breakfasts, sandwiches, salads, and tapas were not the same old, same old. There's an elevator, but I took the series of escalators up to the top floor. Then I made my way through the kitchen equipment department. Outside, there's a giant wooden deck surrounded by glass. In the middle, there's a bar, and on a far side, there's a grill. For seating, there were comfortable wicker chairs and three sets of outdoor lounge couches. Those were very popular. I never got to kick back on those, they were always taken. It is important to note that the restaurant is only open during warm weather months. It closes when it rains, and last orders are at 9 p.m. I started off with a beer. They only have Stella Artois and Staropramen, neither of which I like very much. 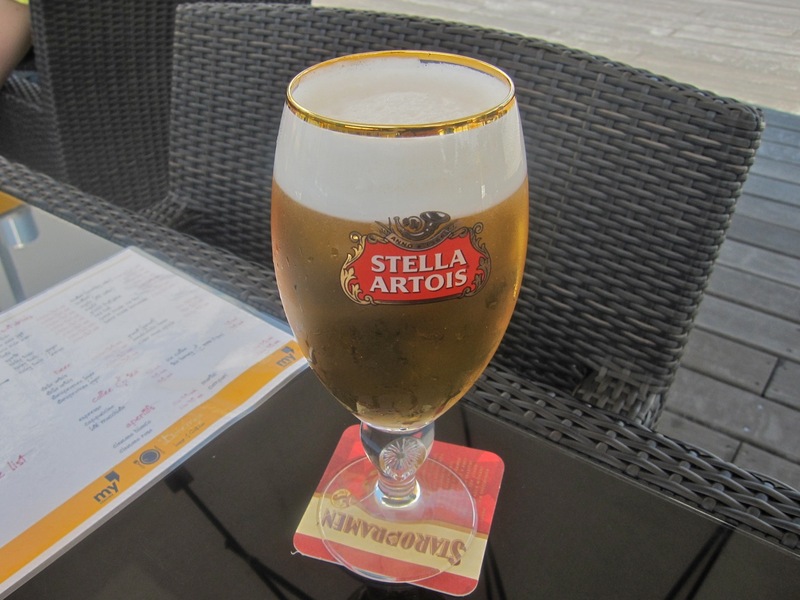 For some strange reason, I received the Staro in a Stella glass. I was assured that this was, indeed, Staro. The beer was so flat that I walked it over to the bar and said I would not drink it. I ordered a Staropramen Granat instead. This was not cold enough for my taste, but at least drinkable. The manager came over shortly after and told me that he was sorry about the problem and the beer would be on the house. I then ordered the most interesting-sounding item on the menu: the watermelon and feta cheese salad (118 CZK). 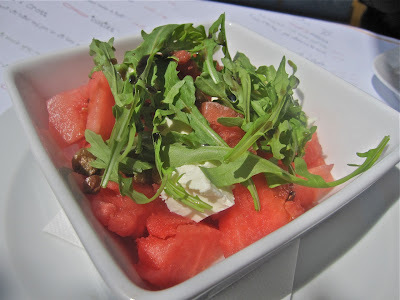 It was mostly watermelon, with just a few rucola leaves and some raisins at the bottom. The feta was creamy rather than the usual blocky, crumbly stuff. Perhaps it was my expectations, but I wish there were more greens and cheese and less melon. 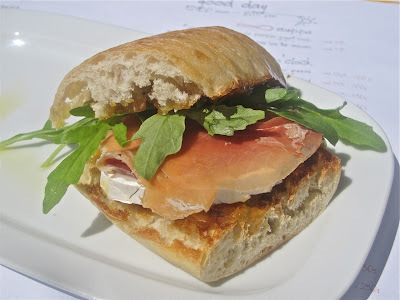 Next, I tried the goat cheese, jamon, and fig jam sandwich (88 CZK). This I liked very much. The high-quality crunchy roll was toasted. The few slices of ham looked like they came from a package at Tesco, but tasted OK. There were some rucola leaves. The round of goat cheese was smooth underneath. Nice sandwich. I decided to be ambitious and order something from the grill. The salmon was unavailable, so I went for the pork neck or krkovice (148 CZK). On the upside, it was thick and juicy and had some flavor from the grill. Some might like how lean it was, but it was tough and there was a lot of chewing. It's not so healthy, but I like my krkovice very fatty and tender. It needed salt and pepper. I wouldn't have minded having a sauce on the side. 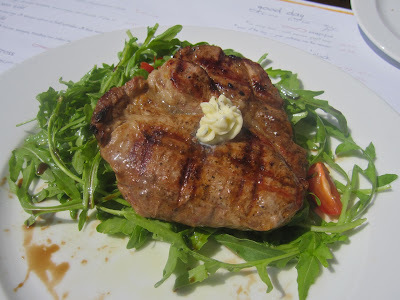 Instead, it sat on a pile of rucola with plenty of balsamic vinegar. The leaves wilted a bit under the heat. I've been pretty cavalier lately about taking pictures, thinking I fly below the radar. But it is starting to get noticed, especially if the manager is an international guy like Ozgur Maden, who is very familiar with Facebook and other media. At the end of the meal, I received a free lemonade. I asked the waitress why, and she just shrugged and walked away. Anyway, it was lightly sweet with a bitter finish. I paid 354 CZK for all of the above. I made my next visit during evening hours when the tapas menu is available. I started with sangria (98 CZK). It was lightly sweet and needed more tartness. This was remedied by squeezing some of the oranges in the glass. It also had apple slices. I liked it a lot in the end -- very refreshing. On another visit, it was served in a different, larger-looking glass. I liked the baba ghanoush (48 CZK). 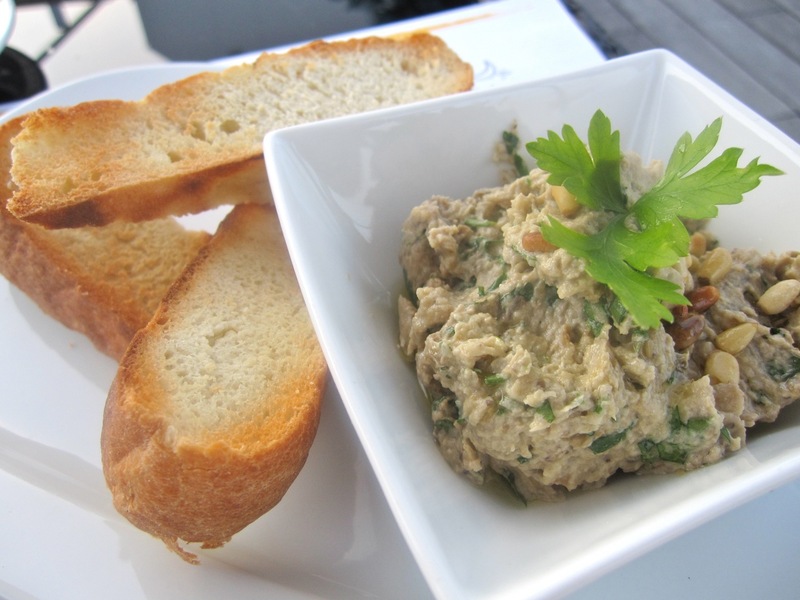 It was very fresh, almost chunky, with pine nuts, lemon, parsley, tahini, and olive oil. However, I didn't detect any smoky flavor. On another visit, it was smoother, not quite as good, with less fresh parsley. However, I did not order it. "The chef would like you to try it," the waitress said as she delivered it. Unless anyone else has been getting free stuff sent to the table, I'd say that my cover was blown. Then I had the kofte (78 CZK). 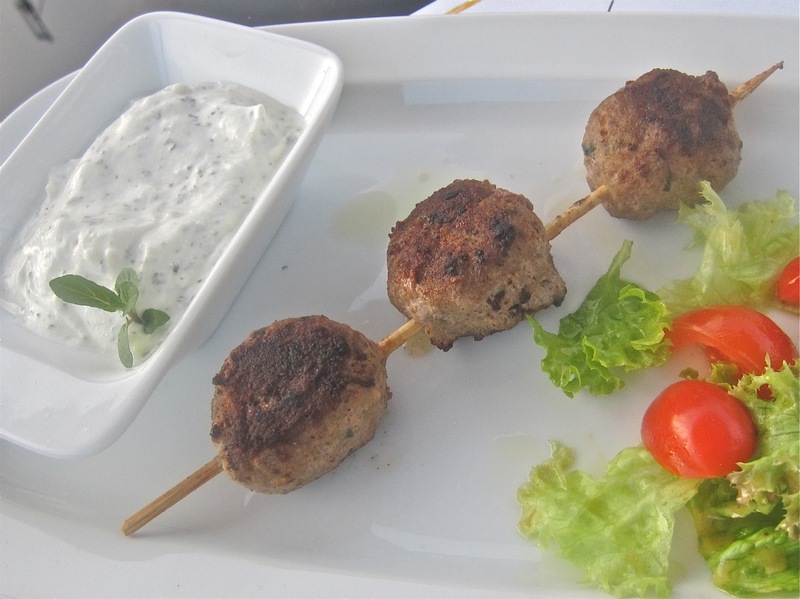 The meatballs had good lamb flavor but were a bit overcooked. The minted yogurt on the side helped. The zucchini pancakes were excellent (48 CZK). I don't know if I was just lucky, but they were clearly just cooked -- hot, light, and fluffy. It comes with garlicky yogurt on the side. They were small, but a great snack. 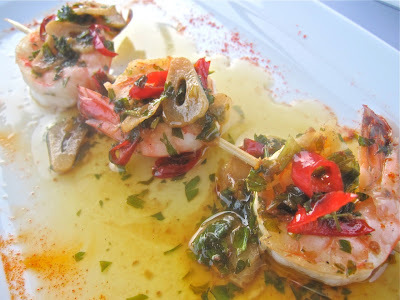 Finally, I had the gambas (88 CZK). The small prawns were cooked just right. But the best part was the sauce. 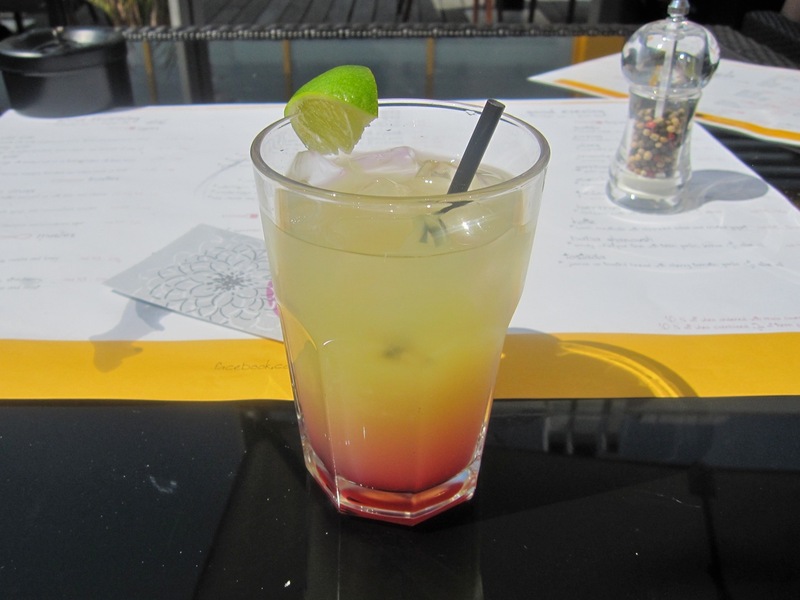 It had a great tang to it and a light heat from red chilies. I was mopping it all up with my extra bread. However, on another visit, the spice level from the chilies was much higher and it was too much for a tender-tongued friend. 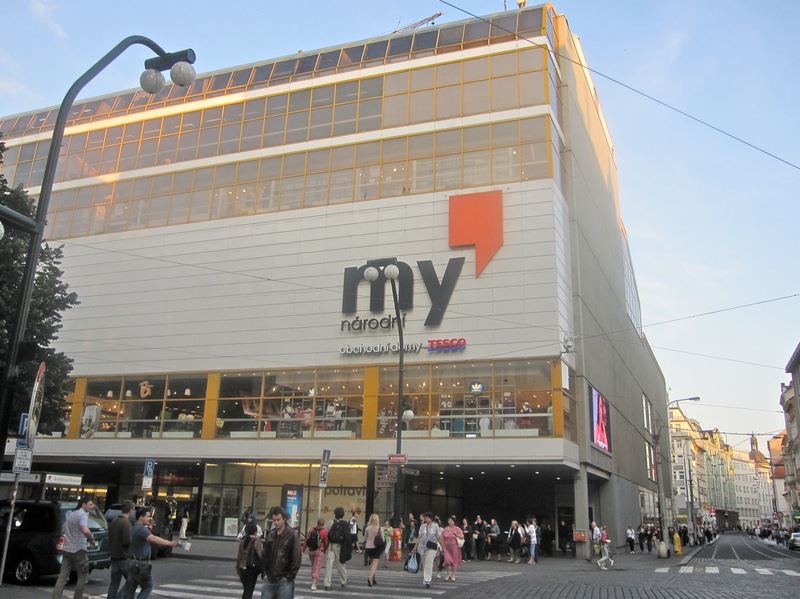 The tab for this visit was 360 CZK. 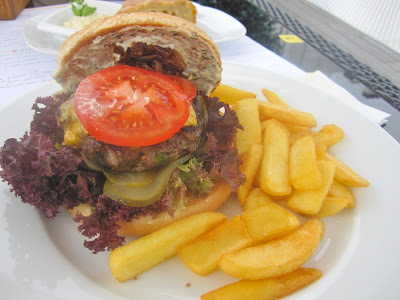 Of course, I returned one more time to try the cheeseburger (148 CZK). It's quite large for the price, but is not really a classic American-style version. The ground beef was mixed with onion, herbs, and spices. It had what looked like parsley in there. The bun had lots of mayo. I liked the caramelized onion. There was too much red lettuce. The burger was a mess to eat, but tasty. The steak fries were nice and crispy. 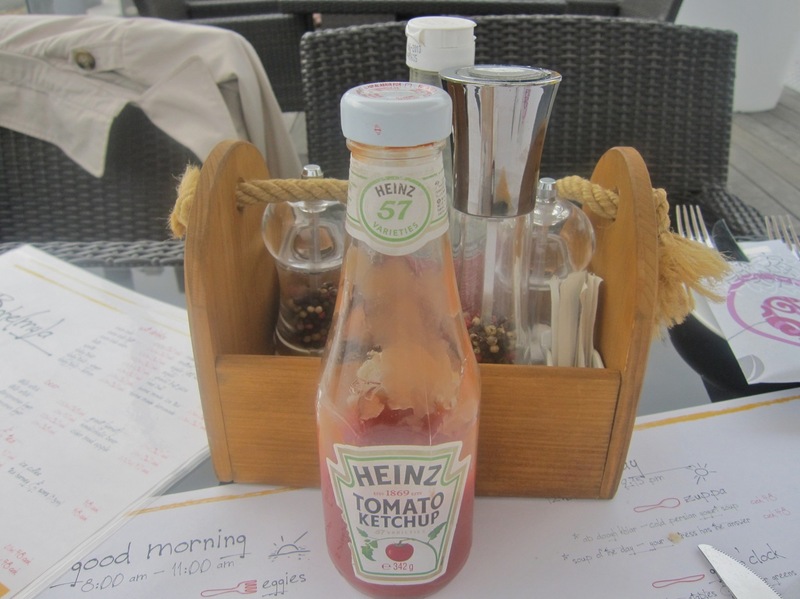 I hate to end on a sour note, but I had a problem with the ketchup that was brought to my table. 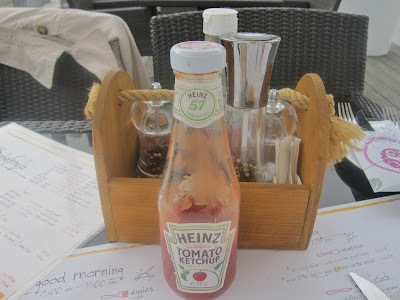 The bottle said "Heinz." 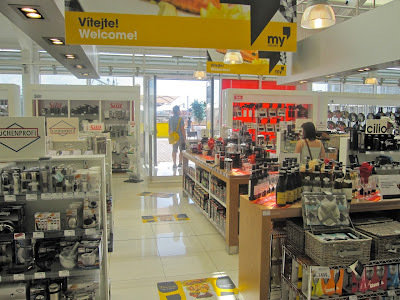 However, the watery red sauce that poured so freely out of it said "cheap Czech stuff." I know Heinz ketchup. Heinz ketchup is a friend of mine. This didn't taste like no Heinz ketchup. Even the label on the bottle was starting to fade from being handled too many times. This was a big sin and should cease immediately. This new concept has been open more than a month. 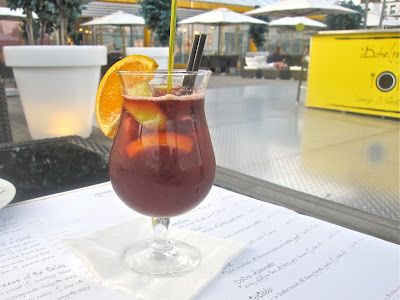 There were certainly problems with quality, consistency, and occasionally, the service at Bohe(my)a Lounge & Grill Bar. Yet, there was enough that I liked, especially the location, that would bring me back. 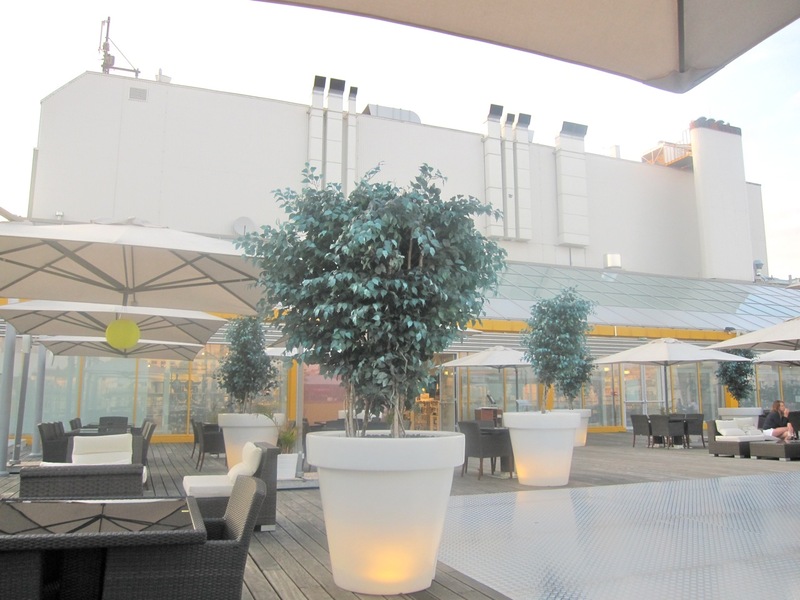 You are in the center of the city, and yet it is easy to forget that and go into outdoor lounge mode. So, yeah, I'll probably climb way up to the top of the stairs again before the summer is over. In large I can agree with you review as I found it just in the beginning of summer and the service have improved greatly since then so Bohe(my)a is certainly on its way. 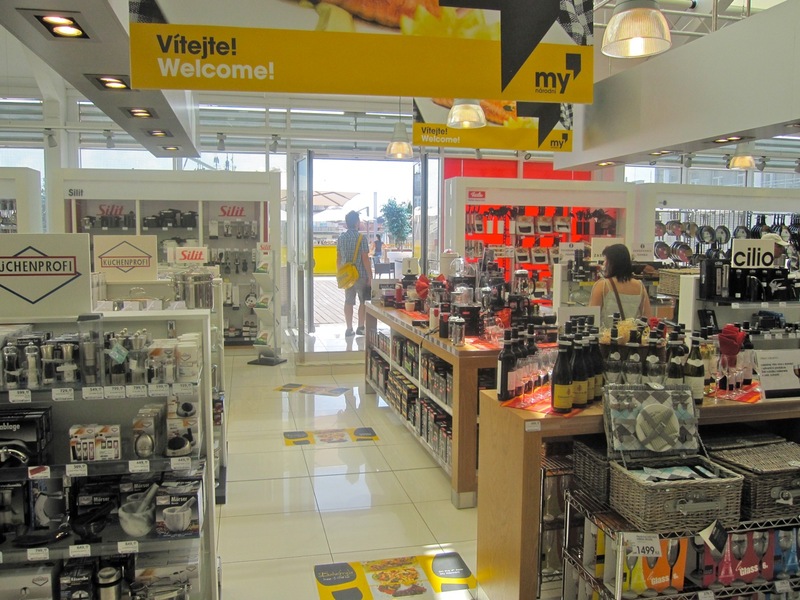 Still it shows that the staff is new and inexperienced but they improve with every visit. 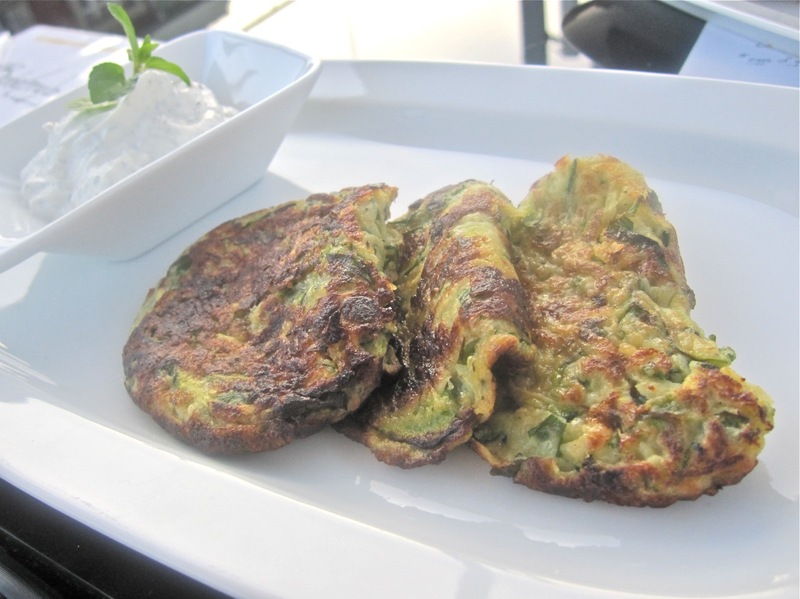 For the food so are the zucchini pancakes always good, also other dishes of the tapas are great. Its a shame you did not try the desserts as, personally, I consider the Very Moist Carrot Cake to be among the best, if not the best (I have not tried BakeShop yet though) Carrot Cake in Prague. I didn't mention it, but I wanted to order the carrot cake on one visit, but they didn't have it. Thanks for writing a review about Bohe(my)a, I'm delighted to hear you've been in our terrace few times and tasted and enjoyed some of our food. Of course we welcome your feedback very much as you've been our customer, we try to do that with every customer whom are so kind to share their opinions with us. We make mistakes, sometimes we are not aware of it and if we don't listen and welcome those feedbacks we'd not be able to know what we have done wrong, therefore improve or fix them. Most importantly those feedbacks gives us the chance to apologise and hopefully make it up for it. I'm sharing those with you and I sincerely hope your worries about being spotted will go away. I can see that you think you've received a special treatment based on what you've experienced, and yes you have but it wasn't because Brewsta was dining at our terrace and we knew it. 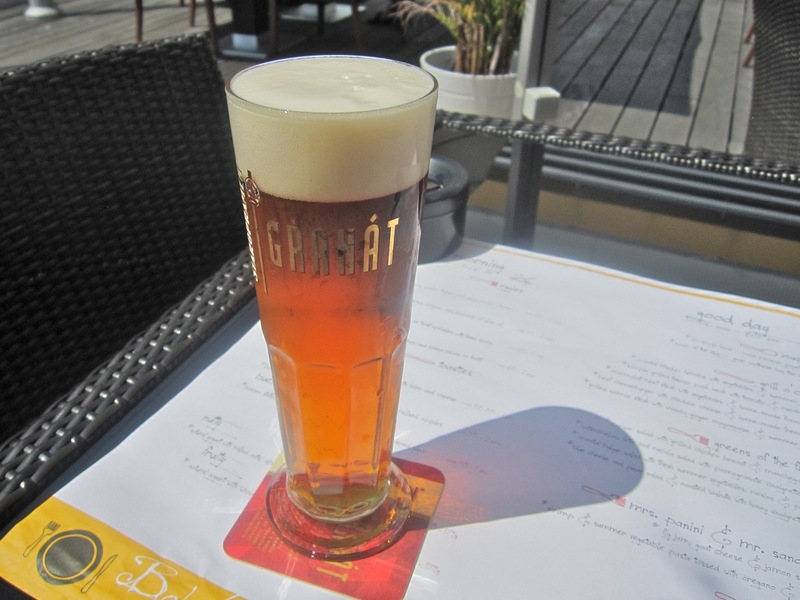 As I've mentioned, we try to make up for our mistakes, so you've received a flat beer which shouldn't have happened and of course the replacement was on us which I believe it is a normal thing to experience in any restaurant or pub; although I know (unfortunately) not so common in CZ. The free lemonade was probably the least we can do to apologise, but your waitress should of told you that and I'm sorry she didn't let you know why you have received it. Regarding freebies, we try to send mezze or tapas to our customers especially when they order multiple items at the same time from our mezze and tapas menu, so you are not alone receiving free baba gannush and I hope it made you feel special not because you were who you are but you were our customer. So, please don't worry, we have no idea who you are though it would be nice to meet you in person sometime. We look forward to have you on our terrace again and welcome more feedbacks from you. I remember going up there when the store was a Kmart. It was pretty standard cafeteria food then. It's nice that they're making it more inviting now and it should be a nice place once the food and drink get in line. Hi, I only do Blogging for Fun. However I never take Photos of Food Served. Nothing Brings more attention. Lost count of People pretending to take photos of themselves, but really taking it of the Food. Does not Fool me, certainly does not the Restaurant Owners. I enjoyed the Prague Post Heavy Hitters. Was a Shame about the Weather though. I had originally been up to Bohe[my]a Lounge to check whether there is a good selection of vegetarian food-[there is] ,and whether one can book a table-[only for groups of 6 or more].Prices are very fair for the quality too. 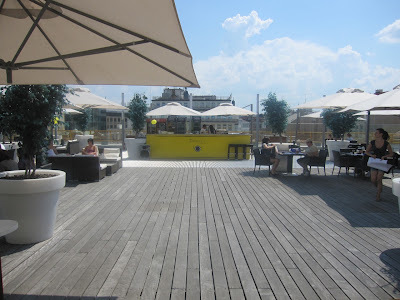 The manager was very welcoming and I really liked the urban beach and chic atmosphere up there. We returned to eat on a brilliantly hot and sunny early evening and ordered the lemonade drink for me-just right- and a white wine for my husband. Then we ordered a selection of six vegetarian tapas. Our waitress soon came back with apologies that the tortilla had not yet been cooked, so we substituted another Manchego cheese-leaving us with enough for lunch the next day! All the tapas and dips were of excellent quality and really delicious. We asked for more bread to see us through, and this arrived promptly. Service was, on the whole very cheery, friendly and speedy-apart from one waitress who could barely crack a smile or bother to say a word-and the uniform is smart and colourful. I have already arranged to eat there again with a friend on my return to the city-let's hope for more sunny weather in August, and that the carrot cake is still on the menu-I was too replete to try that! We did comment that it seemed a million miles from the centre of town, and the English couple who arrived after us kept marvelling that this really WAS Tesco--the UK stores could learn so much from this! This looks nice, although the food looks below average, I will defiantly try it for the setting. Look forward to seeing them improve with time and experience. I'll try it for the setting. Not impressed with the food review, but I am sure we'll look forward to seeing this improve with time and experience. Thanks again, I LOVE your reviews!!! I've been there a few times and have always enjoyed the food and the friendly, enthusiastic service. I also got a free glass of lemonade! Nice and sunny place (back than, there was a yellow thing on the sky sometimes..), the view is not great as it is not located on the top of "MY", but nice to be out of the narrow streets in the back Narodni for a change. Less impressive was the service, a guy took our drink orders, told us that someone else will take the lunch orders soon - both never happened, so we had to ask back twice after 15min. No harm done, we had a day off, but if you want to attract business lunchers, this will not do it, even with an hour break. Having student waiters is OK (and needed in this country if you want someone to speak english :), but if communication is that sparse between them, problems arise. Hope that was dealt with as it sounds, will try again..hopefully with sun.